Sacramento Police Chief Daniel Hahn. On July 22, Sacramento police officers were in pursuit of a 16-year-old boy who had been stopped for riding a bike without a light on it. As the boy ran from an officer who was chasing him on foot, an officer driving an SUV joined the pursuit, eventually catching up to the teen and hitting him with his vehicle before coming to a stop in the front yard of a home in the neighborhood. The Sacramento Bee reports that on Friday afternoon, the Sacramento Police Department released the body camera footage from the officer who was driving the vehicle. In the video, the officer swerves his vehicle to the left, toward the path of the boy—who is coming down the sidewalk. He strikes the boy on the sidewalk, and the boy is thrown on the roof of the car before being tossed several feet in the air. The SUV continues forward and comes to a stop in the front yard of a home. 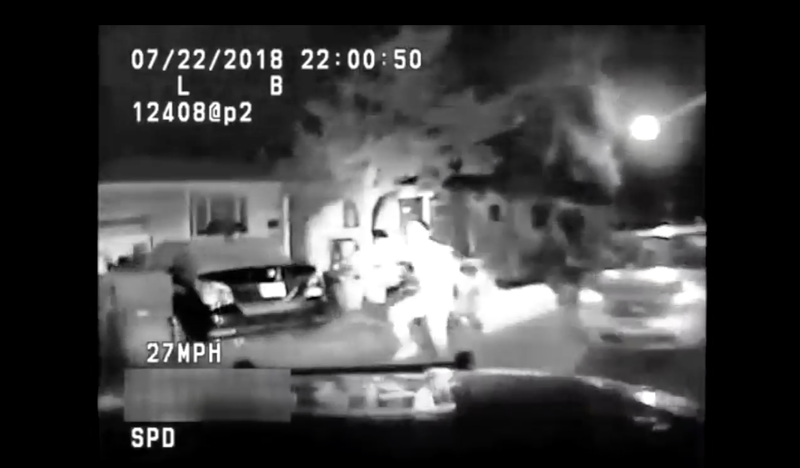 The video comes just as the department has adopted a new foot chase policy in the wake of the shooting death of Stephon Clark in March. The investigation into the shooting remains ongoing, and the officers who shot and killed him have been back on the job since April. The officer driving the SUV was reportedly going just 27 mph when it struck the teen, but Detective James Allen of the major collisions investigation unit said in a department video that the actual speed of the vehicle is still under investigation. It is unclear from the video whether the officer intended to hit the boy or not. After the boy is hit, the video shows the officer get out of his vehicle, roll the teen over, and handcuff him. The officer then asks the boy where he was hurt. Police said the boy was transported to the hospital with non-life-threatening injuries. The Bee reports that a different camera from inside the vehicle showed the boy trying to move out of the way of the vehicle at the last minute, but getting hit anyway. It’s just one more ugly mark against a department that is already facing a lot of public scrutinies.